The streets of early Black Hawk County towns were originally rough paths that could choke you with dust or bury you in mud, depending on the season. For the first few years after Cedar Falls' founding, Main Street featured an obstacle course of stumps left over from the clearing of the original tree cover. Today's concrete street surface is a relatively new invention. 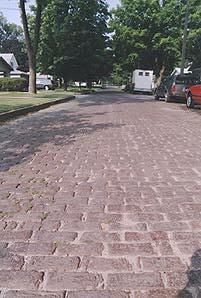 The original paving material in the older parts of Cedar Falls and Waterloo was brick. The only remaining example of a brick street in Cedar Falls is this short section, paved in 1908. The bricks used in street paving were known as "pavers." They were much larger than bricks used in buildings and were laid with a sealer between the bricks to keep out moisture. As new techniques of street paving were introduced, Cedar Falls' brick streets were torn up or covered over by concrete and asphalt. Paver bricks found their way into many local gardens, driveways and sidewalks, where they may still be seen today. The only remaining brick street is in poor condition, due to deterioration of the sealer material. Attempts to repave this section with concrete have thus far been unsuccessful, due to public opposition.